Note: This tool is no longer supported, and is not included with Aurora Suite, it is available upon request from Aurora Systems Technical support and provided on an as-is basis. 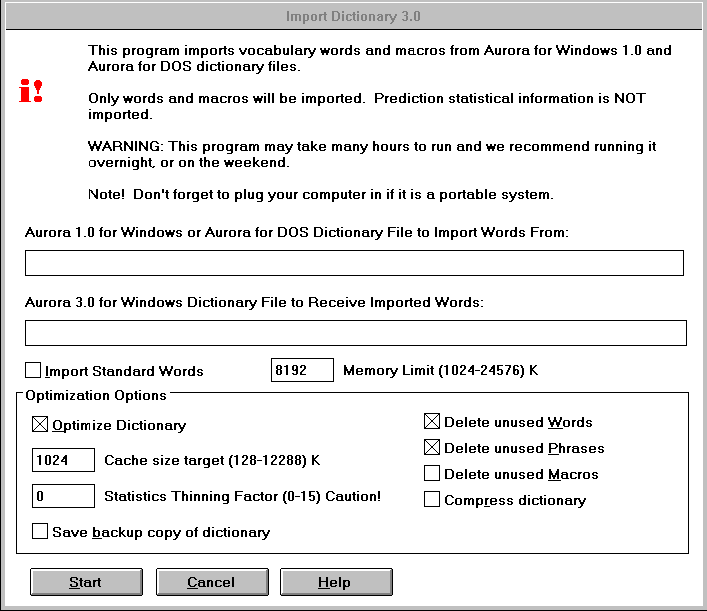 The Aurora Dictionary Import Tool allows you to import words from Aurora 1.0 for Windows or Aurora for DOS dictionaries. Aurora Suite will read Aurora 2.0 and 3.0 for Windows dictionaries directly, so you do not need to use this tool if you are upgrading from Aurora 2.0 for Windows or later. This program does not import prediction information, so any next word prediction information from the previous version's dictionaries will be lost. This program may take several hours to run so we recommend running it overnight. Don't forget to plug in your computer if it is a portable system. Note: This tool comes bundled with the dictionaries from Aurora for Windows 3.0. This tool does not support Aurora Suite format dictionaries directly, so to import an Aurora for Windows 1.0 dictionary or Aurora for DOS dictionary, it must first be converted to version 3 format using this tool, and finally opened with Aurora Suite which will then convert it to Aurora Suite format. Enter the full path and file name of the Aurora for DOS or Aurora 1.0 for Windows dictionary file that you wish to import vocabulary words and macros from. You do not need to import Aurora 2.0 for Windows or later dictionaries, Aurora Suite will read them directly. Enter the full path and file name of the Aurora 3.0 for Windows dictionary file (provided with this tool, NOT an Aurora Suite dictionary file) that you wish to add words from the Aurora 1.0 for Windows or Aurora for DOS dictionary to. You may also enter a new dictionary file name to create a new Aurora 3.0 for Windows dictionary file containing the vocabulary from the old dictionary but this dictionary will not contain any next word prediction statistics. If this checkbox is unchecked, Import will complete much more quickly because it will only import words and macros that you have added, or that have been learned. Words that are part of the standard vocabulary will not be added. Note that some words that were standard in the Aurora 1.0 for Windows dictionaries are not standard in the Aurora 3.0 for Windows dictionaries and to add those words to your dictionaries, you will need to check this checkbox. This is the amount of memory that the Import tool is allowed to use. We recommend you set this value to at most 2048K less than the amount of memory in your computer. The larger the value here, the faster this program will complete. If you have 4M of RAM (memory) in your computer set this to 2048. If you have 8M of RAM (memory) in your computer set this to 6144. If you have 12M of RAM (memory) in your computer set this to 10240. If you have 16M of RAM (memory) in your computer set this to 12288. If you have 24M of RAM (memory) in your computer set this to 20480. If you have 32M of RAM (memory) in your computer set this to 20480. If this checkbox is checked, after the words have been imported, the Aurora 3.0 for Windows dictionary file will be optimized for best performance. If this checkbox is not checked, all options in the Optimization Options group will be disabled. This should be set to the same value as Cache Size in Aurora Prediction's Prediction Options dialog. For an 8M RAM system, we recommend 1536 for this setting. For a 16M RAM system, we recommend 2048, 3072 or 4096 where larger values will give better performance. This should be set to 0. Setting this to any other value will remove prediction statistics information from the dictionary reducing its ability to predict next words. If you check this checkbox, a backup copy of the Aurora 3.0 for Windows dictionary file will be made during optimization. Note: You will need enough free disk space to contain two complete dictionary files for optimization to complete. Delete learned but unused words, phrases, and macros from the dictionary. It is generally good to check words and phrases, and uncheck macros. Do not select this option, older compressed dictionaries are not compatible with Aurora Suite. After conversion to Aurora Suite format, the dictionary can then be compressed using dictionary optimization.